This is not a Christmas card for everyone. 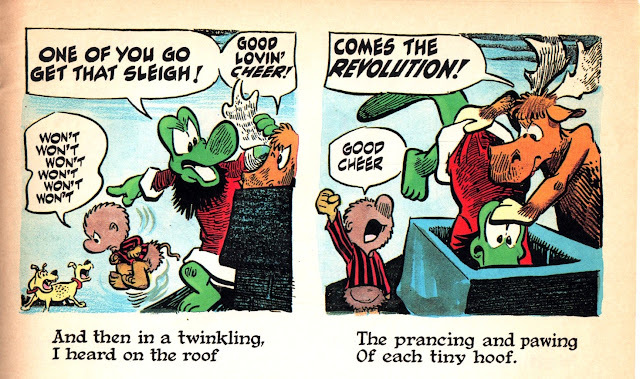 Heck, it's not even a NICE Christmas card. 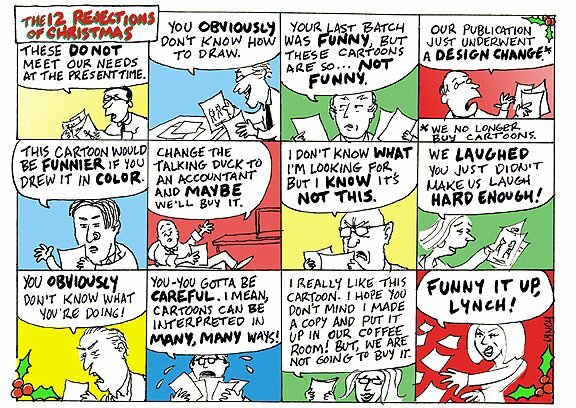 This is for cartoonists. And these are all true things that were said to me. 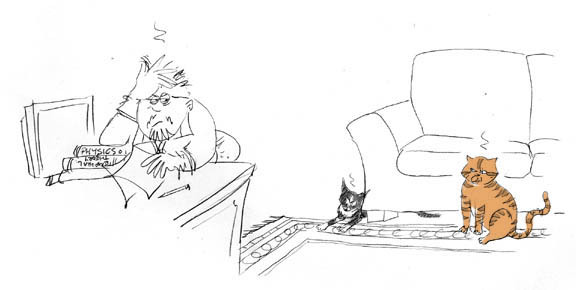 Everyone has experienced rejection, but cartoonists experience it regularly. 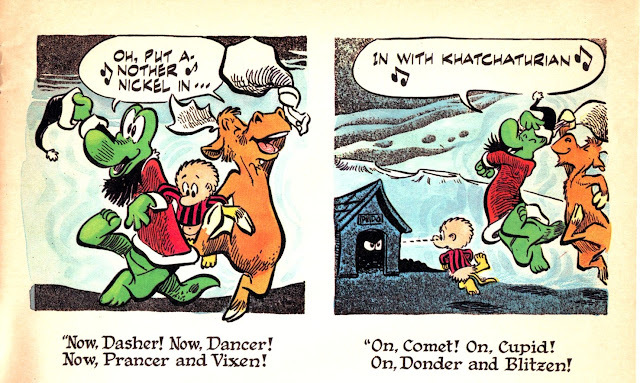 Every once in a while, the Berndt Toast Gang (the National Cartoonists Society Long Island chapter) would have a "rejection show," where successful professional cartoonists would bring in their rejected comic strip ideas, rejected proposals, rejected illustrations, and so on. There was a lot of gorgeous work. All of it unseen. 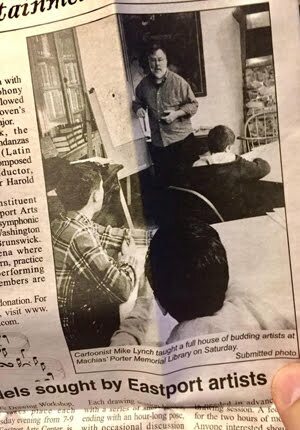 "If we ALL brought in ALL of our rejections," the late Joe Edwards (Archie, Li'l Jinx) told me, "the room would be FULL to the rafters." Joe was right. And we were meeting in a pretty large banquet room at the time. So, keep plugging away. You gotta have the misses to get the hits. And remember, to quote CBC TV's Red Green, I'm pullin for ya. We're all in this together! Related: Rejection is the Key to Success. 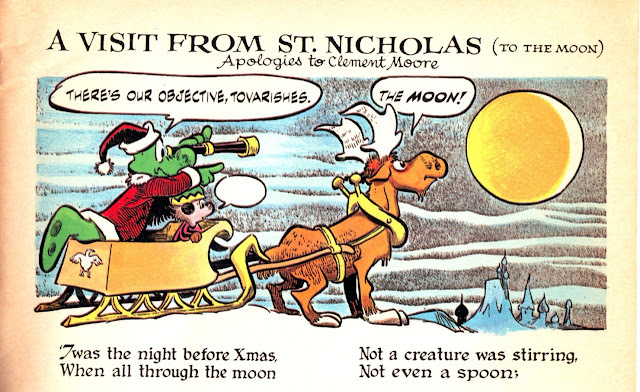 It's Christmas time and that means that it's time to sing our favorite carol ("Deck Us All With Boston Charlie") and read "A Visit From St. Nicholas (To the Moon)" as reimagined by the one and only Walt Kelly (with "apologies to Clement Moore," natch). 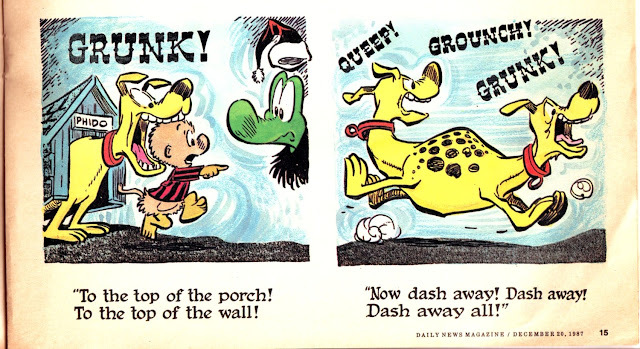 It's originally from a POGO book titled GONE POGO (1961, Simon and Schuster). 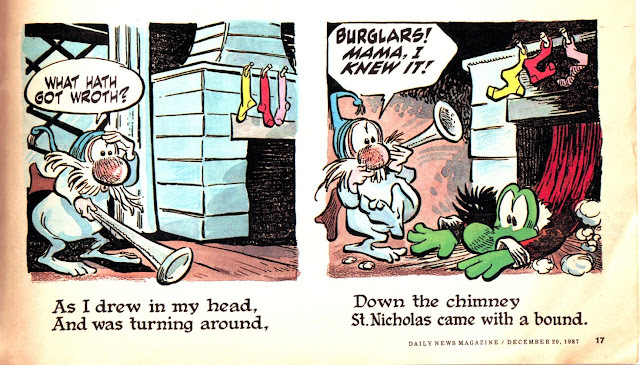 It would be printed once more, 26 years later, newly colored by Joe Orlando (!) 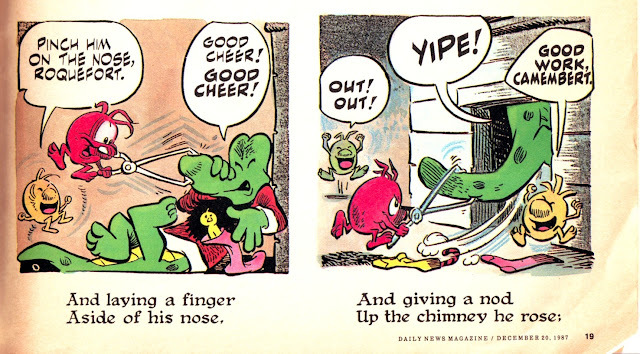 and Angelina Genduso, for the December 20, 1987 edition of the Daily News Magazine. 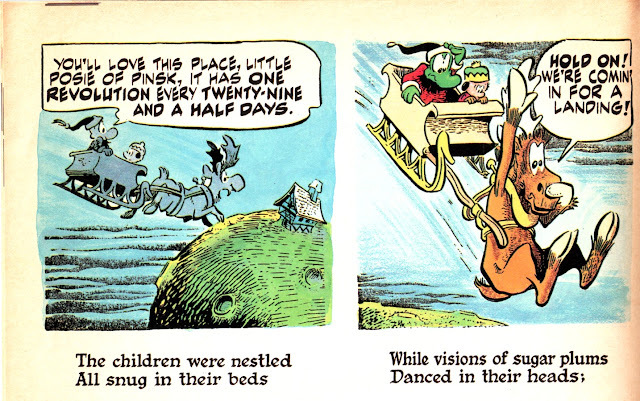 This is all copyright the Walt Kelly Estate, with Jay Maeder's piece copyright 1987 by Jay or maybe The NY Daily News. 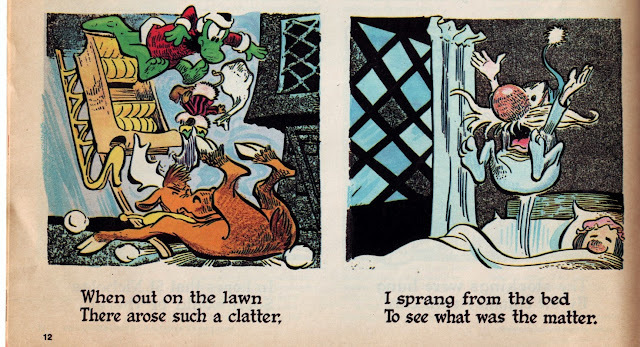 Click to enjoy them is giant Kelly inky glory. "... a fairly irascible soul, given to the fine Irish melancholia and possessed of no immense generosity of spirit when it came to his fellow human specimens. 'People are basically idiots,' he reflected in one published interview. 'It may come as a surprise to find you're an idiot, but the fact remains you are.'" 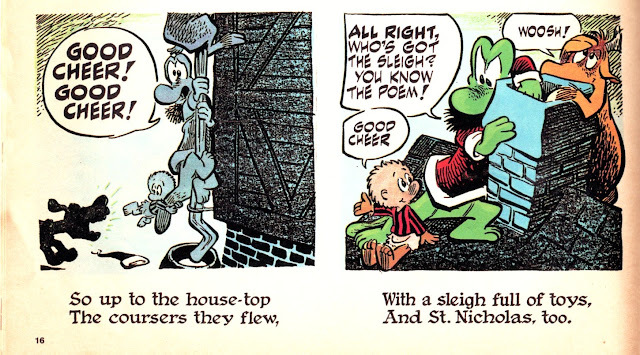 Well, the dichotomy is there: here's a former Disney animator, comic book funny animal artist, and, okay, yes, he may have occasionally been a Scrooge in real life, but judge him not by what he says, but by what he has done. 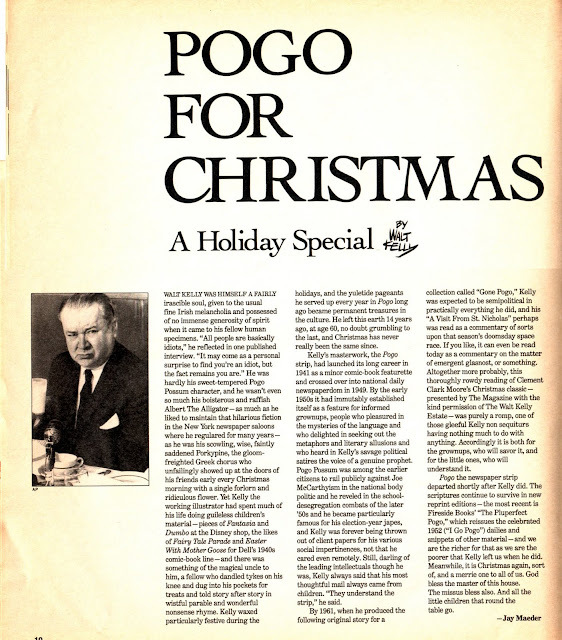 He is, after all, the man who gave us POGO. 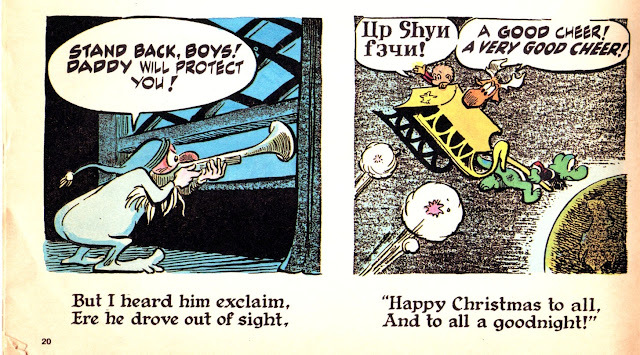 Maybe it sounds idiotic to you, but Happy Christmas to you, Mr. Kelly! We miss you. 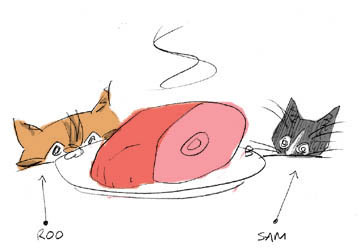 SCAD student Kelsey Goldych did this two minute animation. Watch the whole thing, including the end credits. She really did a terrific job here. 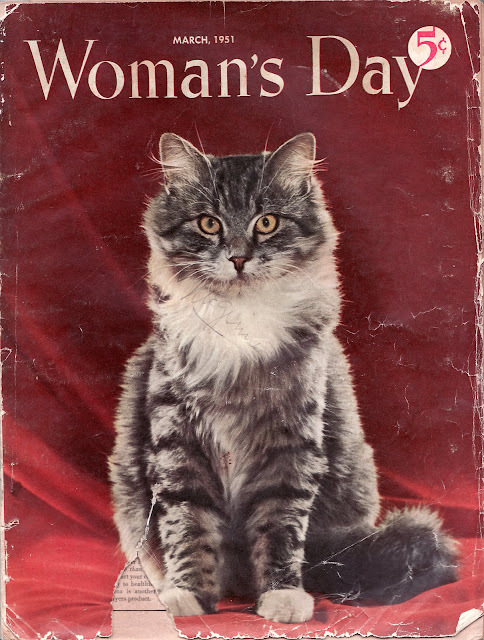 Just look at this cat! Perfect! Here's hoping she goes on and makes some more great animation in the future! Wow! 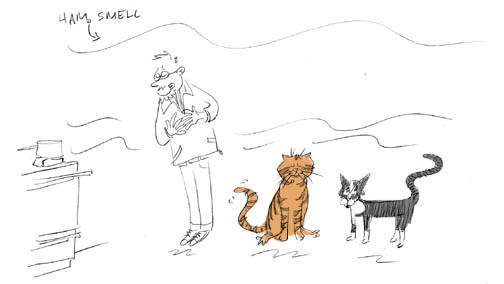 There is nothing half so much worth doing as simply messing about with gag cartoons, to heavily paraphrase Ratty from The Wind in the Willows. 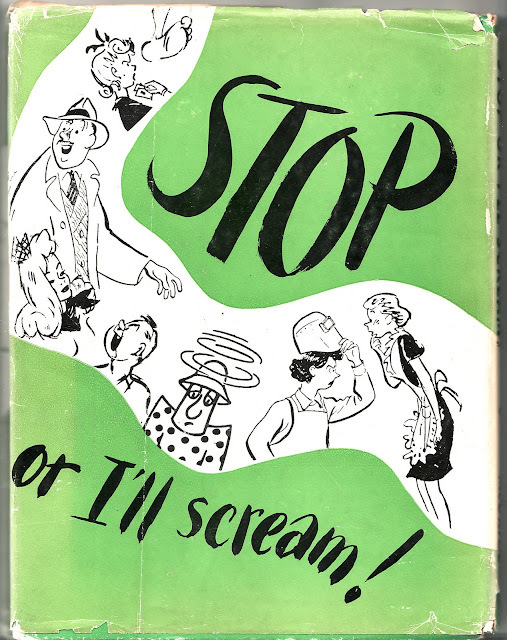 STOP OR I'LL SCREAM, a collection of cartoons from Collier's edited by its cartoon editor, Gurney Williams, was published by Robert M. McBride and Company in 1945 and copyright same. 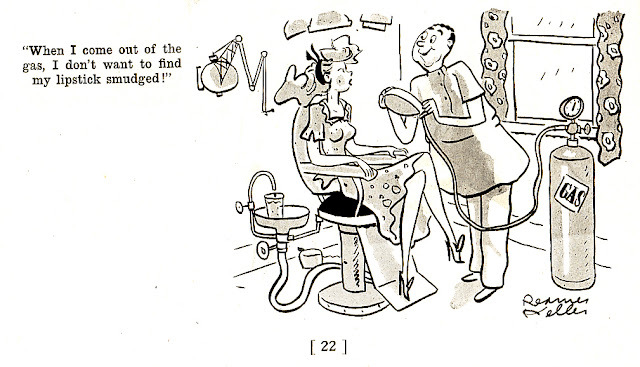 "An Album of more than 300 funny drawings by nearly fifty of Collier's cartoonists," says the interior frontispiece. Regardless of me bandying about $5 words like "frontispiece," here is, for your blog reading pleasure, but a wee fraction of the interior. 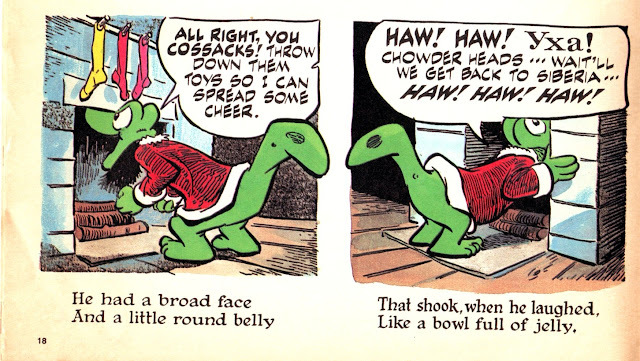 George Lichty's style always looked like his ink line was just slightly out of control. 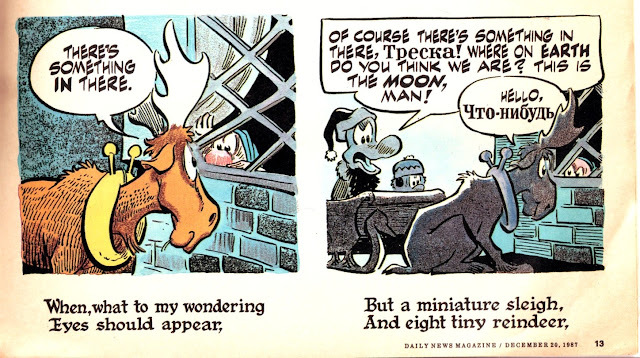 His eccentric characters would later get daily exposure with his Grin and Bear It syndicated daily panel. 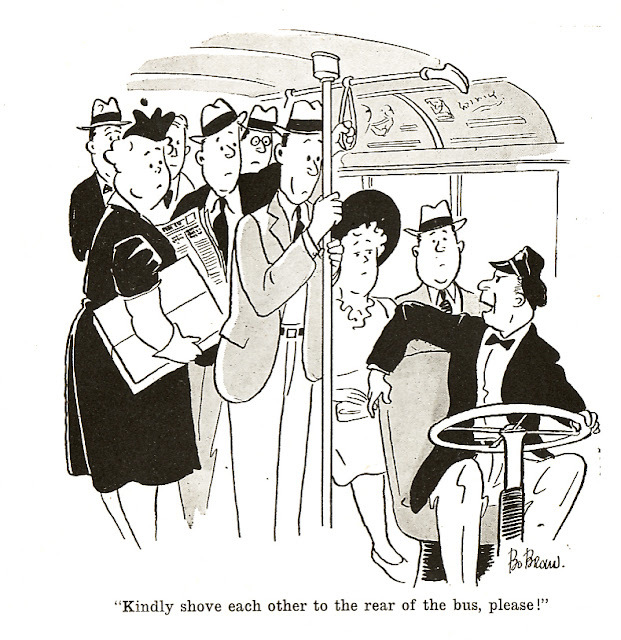 Bo Brown's cartoon reminds me that not that much has changed with bus interiors in 62 years. We still got the straps, the poles, and the rude drivers. 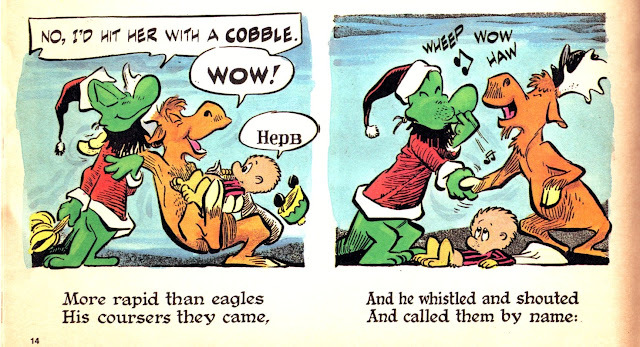 Sam Cobean contributes a wordless adventure. Like I mentioned yesterday, he would have been better remembered to today had he not passed away too early in a car crash. Another Cobean. 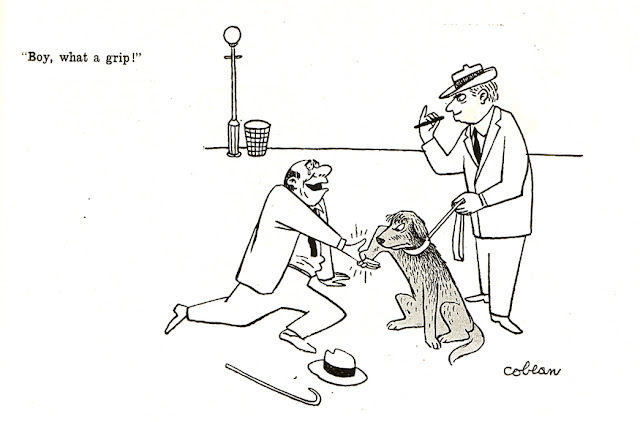 Lovely touch: the dropped hat & cane. 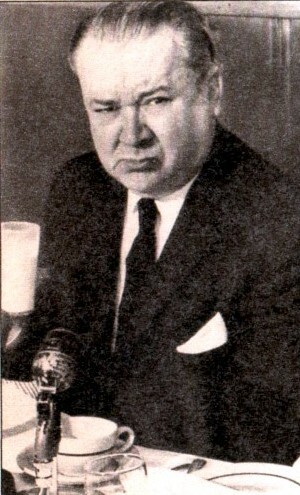 Virgil Partch or "VIP." 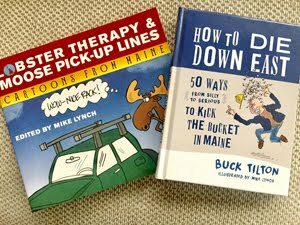 Another cartoonist killed in a car wreck! 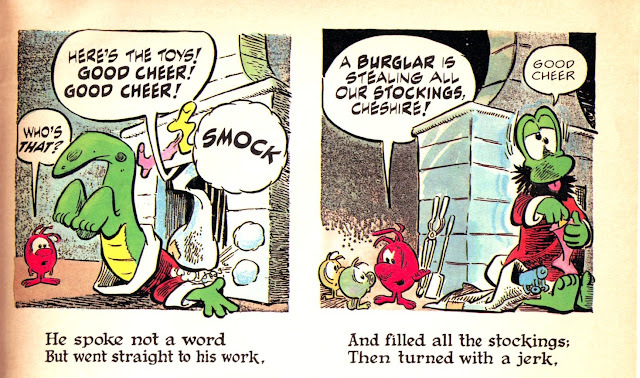 At least VIP had a couple more decades' of work out there and he's still well remembered today. Just go and Google the guy! 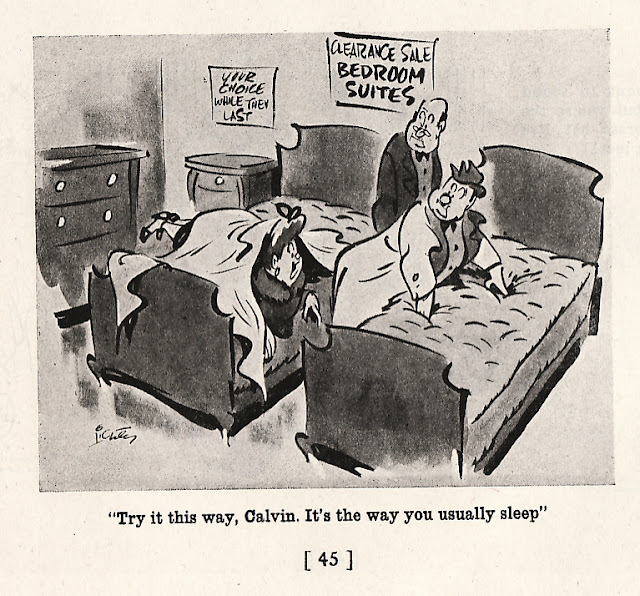 A great, unique gag. 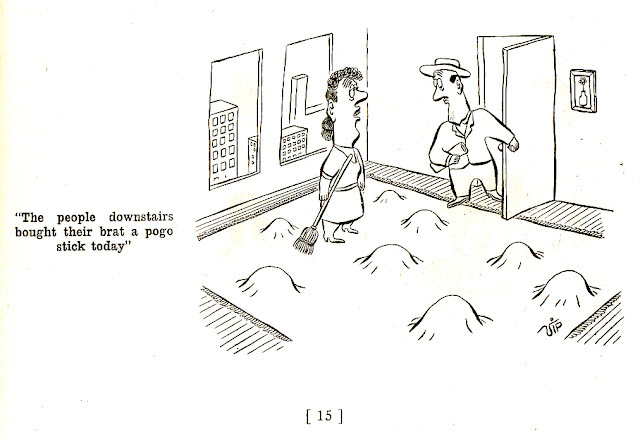 Reamer Keller contributes a pre-sexual harassment era gag that would garner rejection after rejection these days. 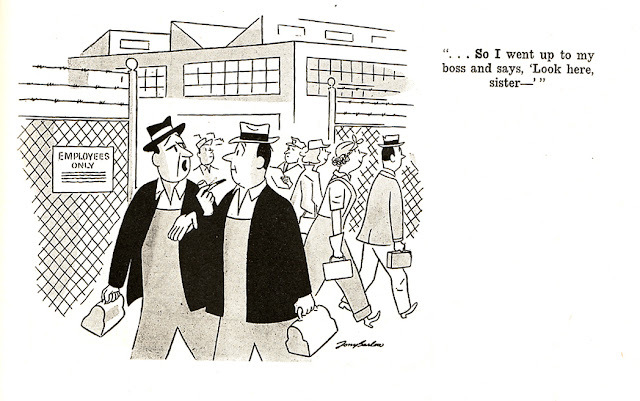 By the end of the war, a lot of the ladies were involved in running industry -- but then again, if you didn't all ready know that, then you picked it up painlessly from the cartoon, didn't you!? Dead pan, spot on Chon Day shows us the power of simple lines and a bit of wash.
-- Edited from a blog entry dated October 15, 2007. 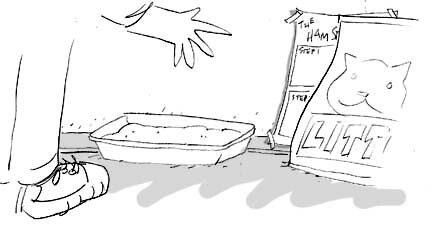 New Yorker cartoonist Sam Cobean puts meat on his table by schilling for Ken-L-Ration dog food, made with "100% real meat! 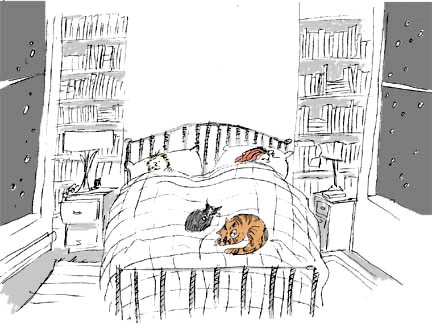 *" Sam Cobean puts lovely energy into his cartoons. It was a tragedy when he died in a car wreck in Watkins Glen, NY at the early age of 38. 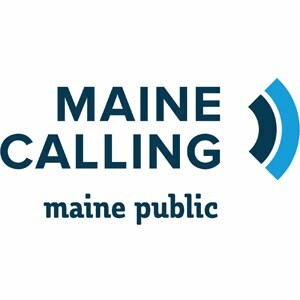 Take a look at his site. It's one of the best. "*U.S. Government Inspected Horse Meat." 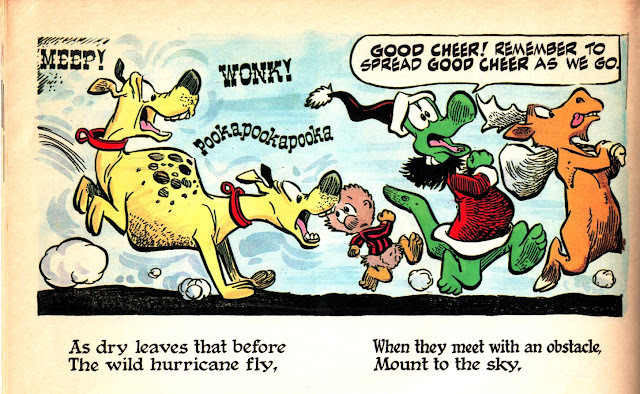 Above, an ad that was probably put together by the Johnstone and Cushing company, a firm that specialized in comic strip ads. 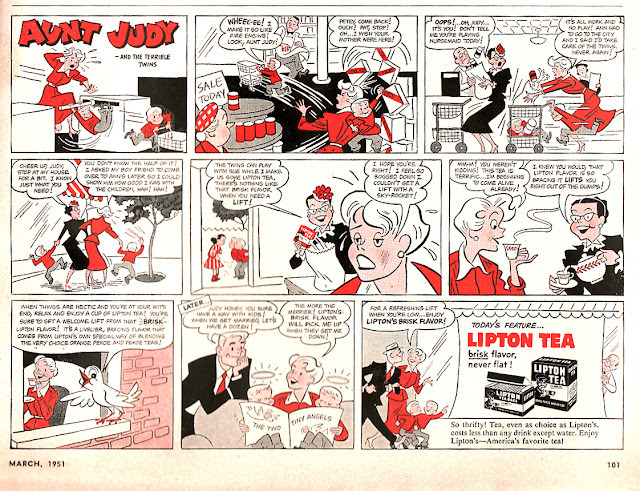 In this installment, our title character get a buzz from Lipton that allows her to deal with the "Terrible Twins," Pete and Pat. Better living thru chemistry! 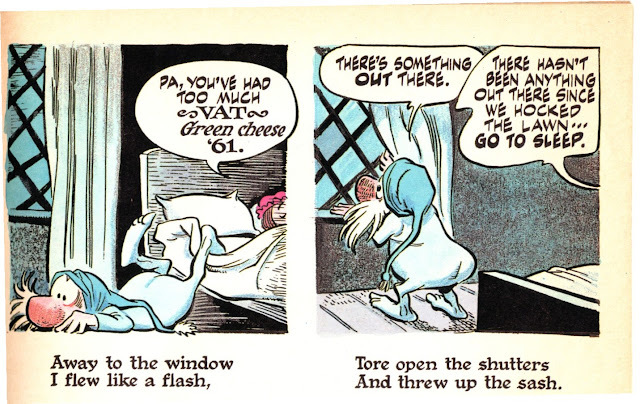 Actually, looks like Petey and Pat met up with some chick in the background of panel 5, and, off camera, she force fed the little terrors a couple mega doses of Ritalin. 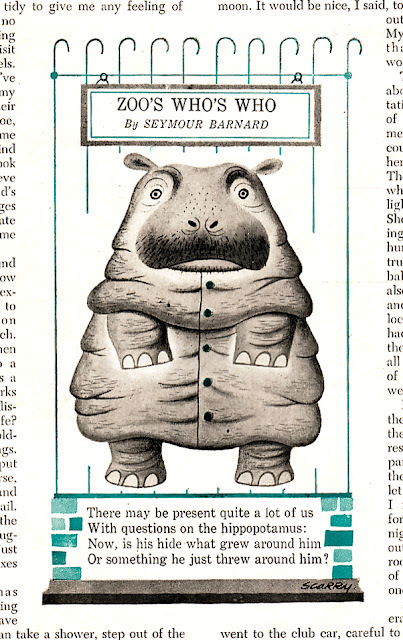 In the middle of an article you get, as a lovely page break, a poem, with a hippo drawn by Richard Scarry. 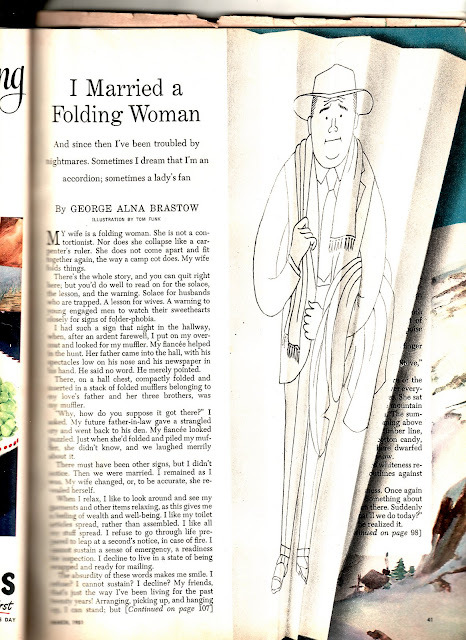 This short story, "I Married a Folding Woman" by George Alna Brastow, complains of his wife's obsession with folding things and putting them away. Yeah, that's our man's biiiig problem: his woman folds stuff. The Eisenhower years! Ack! 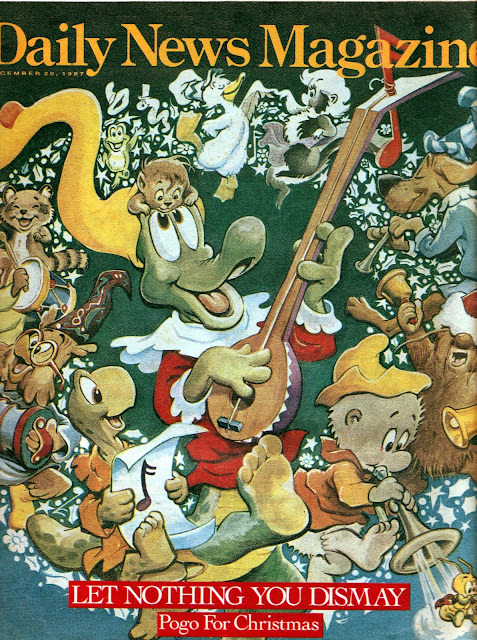 Tom Funk's illustration is nicely done. 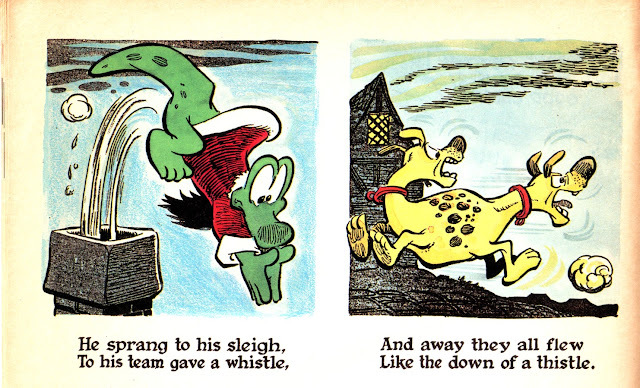 The folded page isn't really folded -- it's all an illusion and an intentional part of Mr. Funk's illustration. 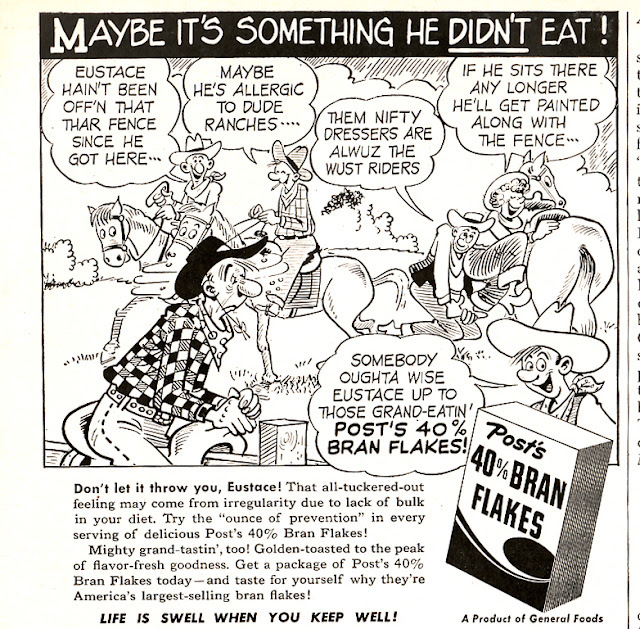 Above: THEY'LL DO IT EVERY TIME ala 40% Bran Flakes! 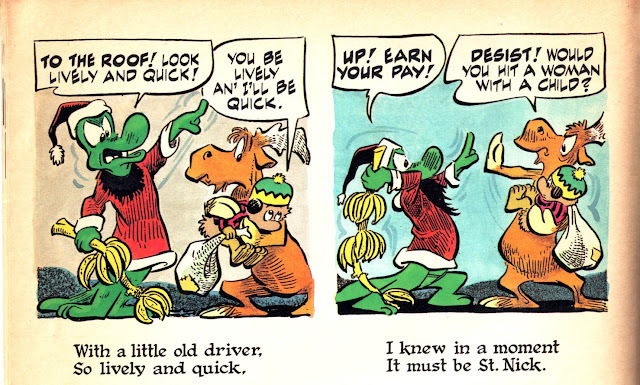 Al Scaduto continued the panel for King Features, from 1989 to 2008. Al started with King right outta high school in 1946! The feature only stopped when he died in 2007. 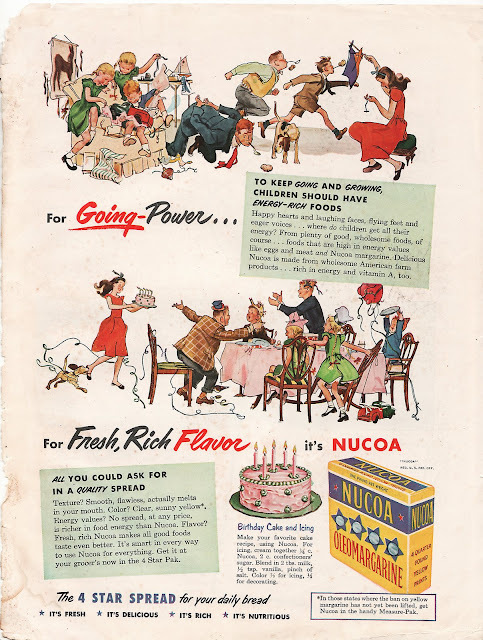 Clear sunny, yellow margarine is the key to good food energy ... unless you live in one of those states where it's banned. 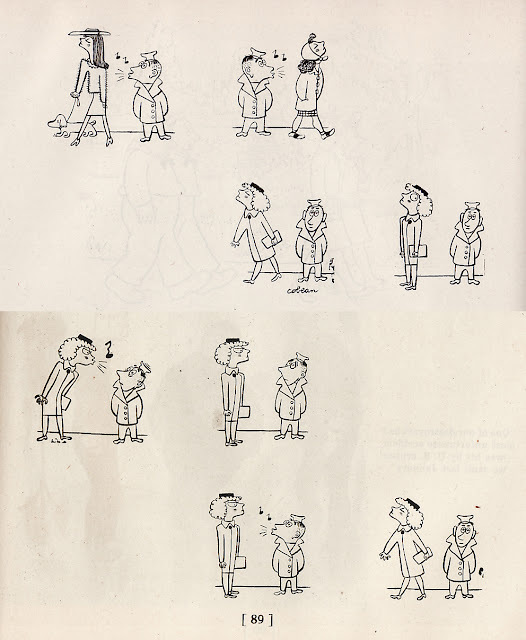 Some energetic figure work by an uncredited commercial artist. 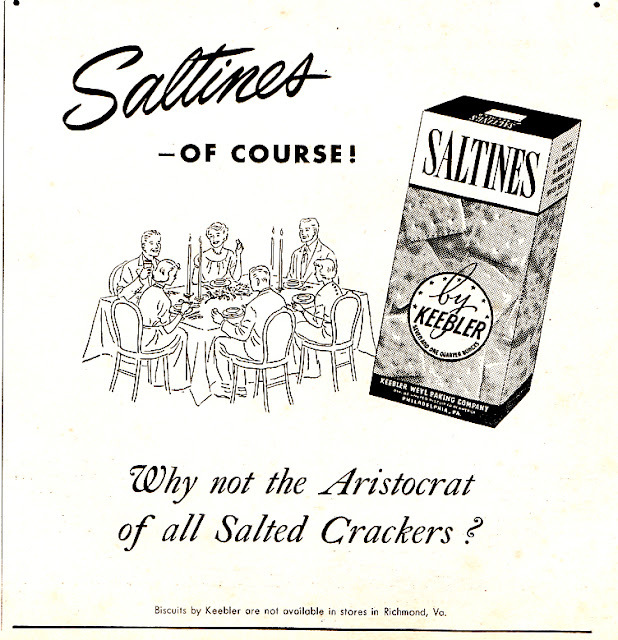 When you are really want to impress those snobby ol' Thurston Howell types, serve soda crackers. Yeah, right! We all know that if you want to impress those classy rich people, serve Ritz! It's named after that ritzy hotel, after all! Click above to super-size, and ask yourself the same question I did upon reading the bottom line of this ad: Why oh why does Richmond, VA hate the Keebler elves? Somebody Google the living heck outta that and let me know, OK? OK! This is all messed up. Give a dog a piece of dog candy and then he will stop being a dunce? Weird. 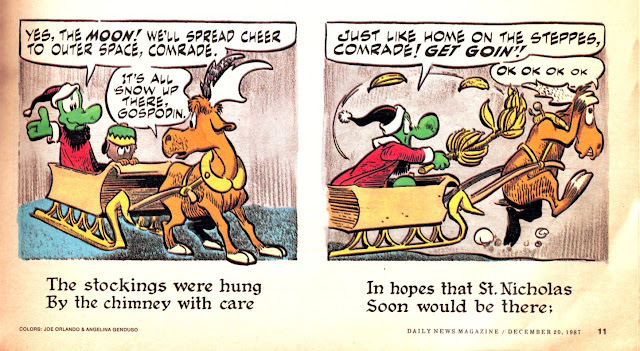 Dogs are kinda dopey to begin with. 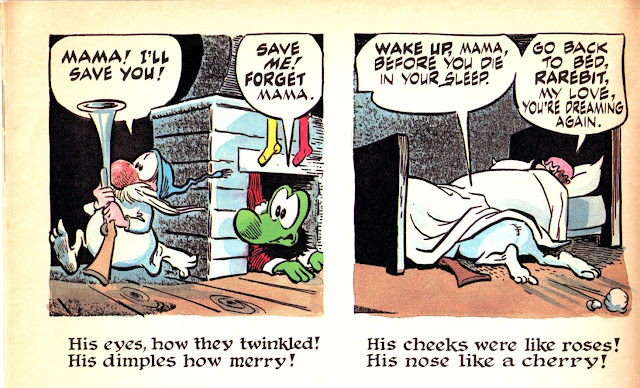 Sweet, but dopey. Candy will just get a dog hepped up on sugar and he'll wee all over the lawn. Oh, and then there's the doggy dentist bills! 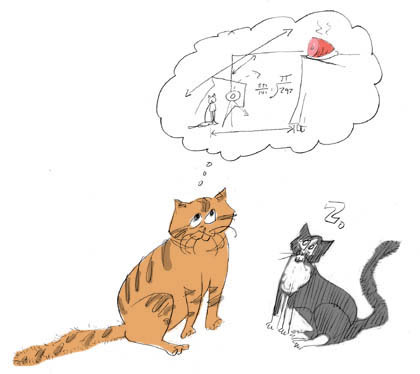 And what is the graph that's in the corner? Oh, I guess it's Charge Healthful Dog Candy's market sales. Corporate America once again using the youth of this country to schill its products. 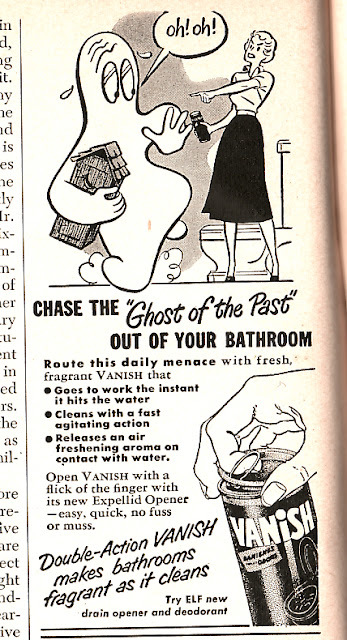 Above: I had to look at this for a minute before I figured out that the ghost is carrying out an old timey outhouse. 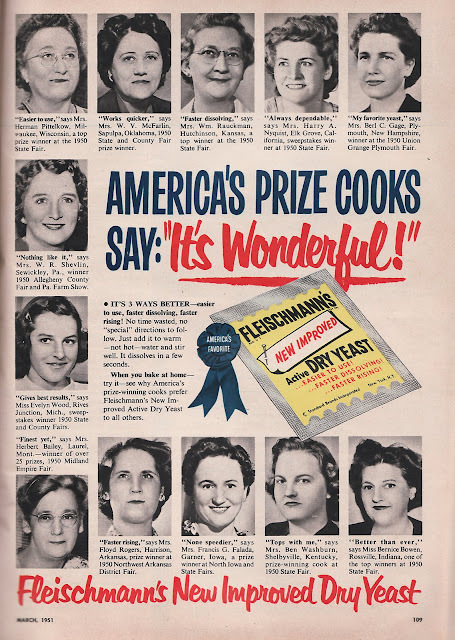 Above: ordinary housewives (you can tell because they're all in glorious B and W) agree that Fleischmann's Yeast is "Wonderful." Today, this ad would've been handed off to a celebrity like Paris Hilton whose reference to yeast is, well, entirely different. That's it. I'll say no more. 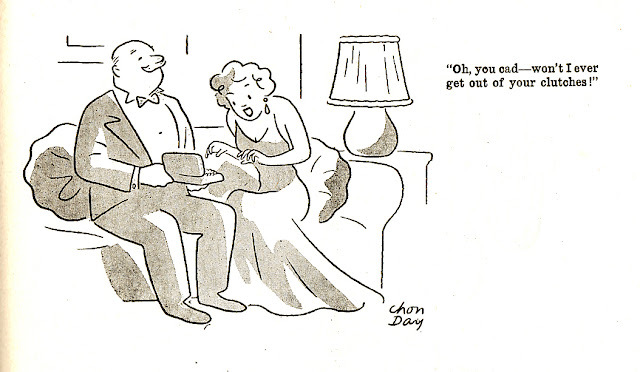 Gag Cartoons from ONE MOMENT, SIR!